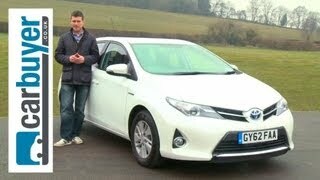 The brand new Toyota Auris Hybrid 2013 has finally been revealed by the Japanese car maker. 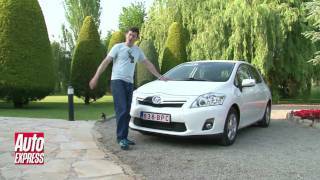 The Auris is supposed to make its debut at the upcoming Auto Show in Paris, but thanks to Toyota we can now have a look at their latest model and see what we can expect from it. The most important aspect surrounding their new hatchback is the fact that it has been designed and built from the ground up, which means that some of the biggest flaws found in the previous models have hopefully been dealt with. The European model will be built exclusively in the UK at the Toyota Burnaston factory and at launch will be available with a 1.4 liter turbo diesel or a 1.6 liter petrol unit. 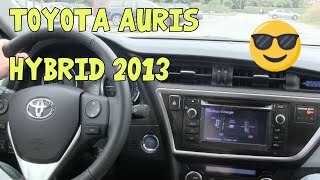 The Auris will also be offered as a Hybrid which will consist in a 1.8 liter petrol engine mated with a nickel-metal hydride battery and an electric motor setup. In addition to these powertrains that will be available at start, Toyota is also planning on launching a model fitted with a BMW-sourced diesel sometime in the future. In terms of design the new Auris comes with a brand new look that resembles the new face of the latest Yaris and Prius models. Dimensions have changed when compared to the previousAuris as well, and the upcoming model is supposedly 2.2 inches less in height. Furthermore, because the new model has been built from the ground up Toyota claims that the biggest flaw with the ongoing version has been dealt with in the new model, and so it will offer a much more generous trunk space. On the interior the new hatchback from Toyota has been completely redesigned and it now features a new ergonomic and high-tech dashboard. A generous touchscreen has been fitted in the center of the dash where it has been framed by discreet light-colored trims. Unfortunately not much more information concerning the powertrains, technology and pricing has been revealed by the car maker, but as mentioned above the Auris is expected to make its debut at the Paris Motor Show where we will definitely learn more about it. The upcoming model will hit the European market in early 2013 so if you really need to buy a hatchback this year you can always consider the Volkswagen Golf and the Ford Focus.